Joe Mauer Channels His Inner Chuck Norris | That's Twins Baseball. A Minnesota Twins Blog. Joe Mauer (Blackburn? Norris?) AP photo playing catch. 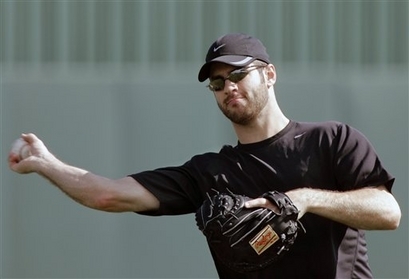 Joe Mauer reported to Spring Training sporting a brand new beard. Some people are speculating that he is trying to hide from reporters who are bound to ask about his contract situation. The staff at TTB have a different take on his new fashion statement. We all have come to know Joe Mauer as the quiet ‘o gee golly’ type of guy in person who lets his bat do the talking. Since he has already proven his skill on the baseball field, especially last year when he was American League MVP and batting champ, he needs a new way to show people he is a god….enter the beard. What made Chuck Norris the badass he is? It wasn’t the round house kicks or terrible acting, it was the beard…… Joe Mauer is now letting his beard do the talking. We asked Micheal Cuddyer what he thought of Joe Mauer’s new beard. “I thought it was Nick Blackburn at first, but once I was told Joe hates when people make that mistake, I went and apologized.” Cuddyer also added “Hey, did you know Joe Mauer doesn’t sleep, he just waits? Did you know that in high school he didn’t believe in the periodic table of elements because he only believes in the element of surprise?” Cuddyer then told us he didn’t have enough time for more questions because he had to go practice magic. So what does the beard hold for Joe, the Twins, and the future….nobody knows. We do know that last year at Yankee Stadium when Brett Gardner was trying to score and Joe dove to tag him, if Joe had the beard, one of two things would have happened, A) His hands would have speared through Gardners chest or B) Gardner would have flown into the backstop like a Korean speed skater tripping his own teammate. No matter what happens this year, fear the beard and if he shaves it off, just remember he can grow the beard and you should fear it.